Today, owning a clamp meter is like wearing your experience on your sleeve. People automatically consider you an expert for using an advanced testing tool that takes quick measurements and reduces the overall testing time. Being dependent on that Fluke multimeter that you bought in the previous century is not going to cut it anymore. You need to work with the times and there are enough reasons to upgrade your toolkit with the best clamp meter. Now, without further ado, here is the review guide listing 12 great models for you to choose from. Your hunt for the best clamp meter ends here. These models are for users who intend to carry out general troubleshooting at home or work. Perfect for DIYers and hobbyists with sufficient functions and low cost that will take care of most requirements. If there is one name that rules the world of testing tools, then it is Fluke. It’s like the Android of the tool market. If you are an experienced technician, half of your tools have to be from this American brand. Recommended by professional industrial electricians, this Fluke meter is the top model in the 3XX series. 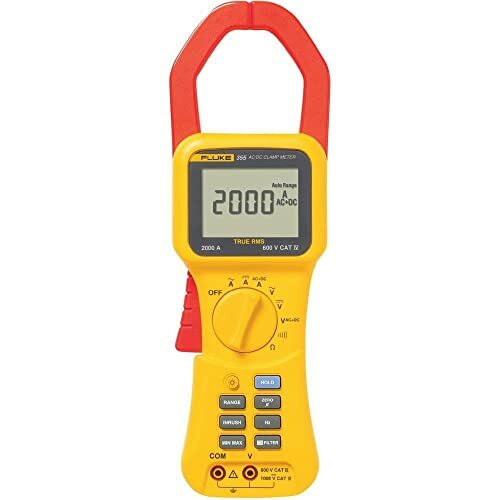 Known for its bright backlight and the ability of measure both AC and DC amperes (up to 400 A) and more quantities like temperature and frequency, this true RMS clamp meter can be your perfect household buddy. Work on a dimly-lit desk in your bedroom when your spouse is sleeping? Don’t worry and get this smart little meter. The highlight of the Fluke 325 clamp meter is that it has a min-max button which gives you the minimum, maximum, and the real-time current reading of a conductor. This comes in very handy if you are troubleshooting circuits and checking inrush currents. Easy to use, portable (with a handy bag) and a brilliant multimeter – what more do you ask for in a clamp meter? This is as good as general-purpose clamp meters get. Most clamp meters have a jaw-like structure that wraps around a conductor, but not the Fluke T5-1000. Its highlight is the OpenJaw current measurement feature which allows you to just put the conducting wire or cable into the cavity and the meter calculates the current. As rugged as the Fluke 325, this meter is a lot less bulky and is amazingly portable. Users who trust Fluke for its reliability also appreciate the fact that its meters can work for decades even if used roughly. That is an attribute Fluke has mimicked in this T5-1000 electric tester, which can also be used as a compact electrical tester. 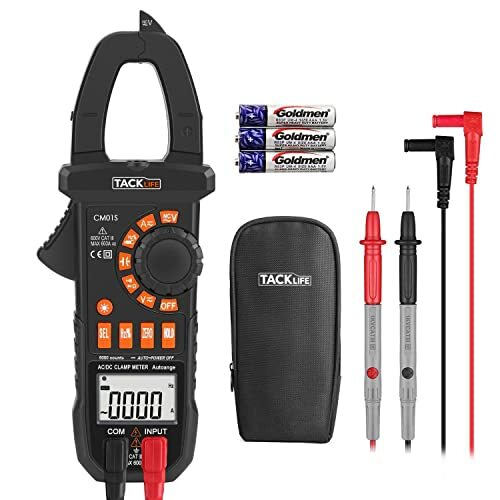 Intended for heavy electricals and maintenance jobs, this is the meter to get if you want ruggedness, AC/DC voltage measurement, and portability. 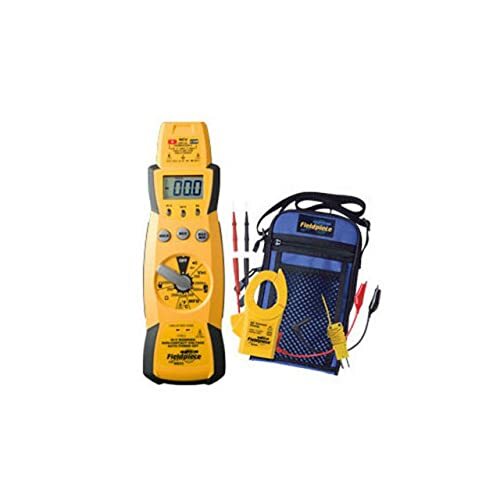 The Fluke T5-1000 electric tester is the perfect tool if you are a maintenance person who needs to check voltage, current, and continuity on a daily basis. There’s really no better alternative. Less than half the price of Fluke, this little beast has an altogether different look than regular clamp meters. Extra functionality was in the designer’s mind as you can fit one of the test leads/probes on the right side of the meter to check measurements without the need for extra help. It is a complete package that measures both AC/DC current and voltage, frequency, capacitance, and temperature. The low impedance function works really great if you need to get rid of ghost voltages during accurate measurements. This is an important feature if you work in high energy, static environments. With a bright backlight and good resolution, the Klein clamp meter gives total bang for your money. This is the best AC/DC clamp meter at this price range that takes care of all possible electrical requirements. These models were handpicked for applications where you have to measure high voltage and current magnitudes. Most models above had a limit of current measurements in the range of 400 to 500 amperes. The following HVAC clamp meter models have higher ranges, making them perfect for industrial applications. 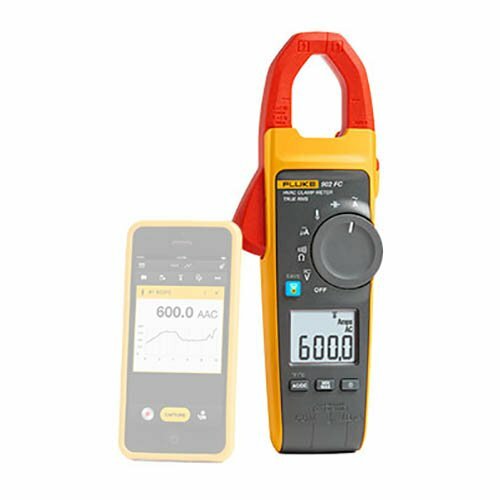 If you are on a budget, then get this Amprobe clamp meter that has all the bells and whistles of the above Fluke meter sans the mobile app. Solidly built to give you accurate readings at even the highest ranges. It can measure both AC and DC current, voltage, temperature, and frequency. Although we had issues with temperature calibration, it’s still a great deal when you look at the price. It’s a very slender meter that can be used in areas that are hard-to-reach, but you will have to press hard on the thumb wheel as it is slightly stiffer than most models. We believe Amprobe made it that way to ensure the user controls it properly. The Amprobe AMP-320 is, however, best known for motor-phase match testing and inrush current measurement. If you work in an industrial environment on a daily basis, then you know how a versatile meter like this can come in real handy. Go for it! 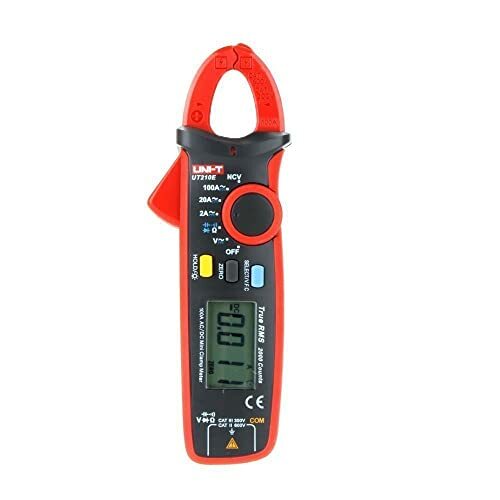 If you are an electrician who occasionally needs to measure high voltage and current magnitudes, then this Amprobe clamp meter is the best. Give the American manufacturer a chance! 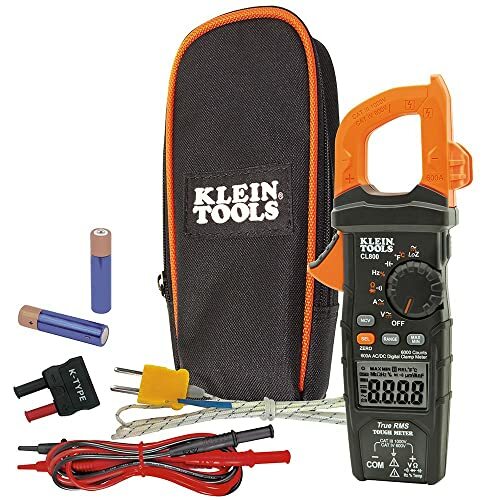 One of the best HVAC clamp multimeters on the market right now, this Fluke model is popular among professionals for its ability to connect with your smartphone. Just use the Fluke Connect mobile app and take readings from as far as 30 meters away from the conductor. This is perfect for times when you need to be in two places at once. The app can also save readings and trendlines for future reference and the ability to share data in real-time. With AC current measurement of up to 600 A (200 µA for DC) and temperature measurement from -10° C to 400° C, this true RMS meter is considered among the top clamp meters. If you are looking for an advanced HVAC clamp meter that has Bluetooth connectivity and cloud storage, look no further. This Fluke 902FC is the one to go for. Priced almost similar to the Amprobe model above, this Fieldpiece clamp meter has few extra functions that make it a favorite among analysts. In addition to the non-contact voltage check function, it also has min-max measurement and data hold feature – both of which make data collection a walk in the park. The downside is the maximum current that can be measured, which is capped at 400 A for AC. It also does not have a backlit display, which can again limit its uses. But it compensates for this with an intelligent design where the test probes can be fitted directly on the backside after use and detachable clamp. If you are a Fieldpiece loyalist then there’s no reason to continue reading this guide. The HS33 is strongly built, has ample functions, and is priced like a steal. We have heard all about features like the mobile app, motor-phase matching, and data hold feature, but there’s more to a clamp meter than you can imagine. The following models are high-end pieces of technology that are packed with mouth-watering features that will make even the most decorated electricians go weak on the knees. Another highly accurate and reliable tool with a wireless measurement feature, this Fluke 376 clamp meter is one of the most advanced models we have seen lately. In addition to the Fluke Connect app, it also has iFlex, an extension cord with a flexible clamp to take measurements in small areas where it is otherwise difficult to reach. An excellent function for those working in heavy industries where there are tens and hundreds of cables wrapped together. Reading the current or voltage on one of these cables is like a dream come true. The impressive range of 1000 ampere AC makes it adequate and often the first choice of professionals for most industrial tasks. It is also a very well-designed meter with a hard body that puts safety first. Even if you are not familiar with Fluke, investing on this will make you start believing in the “overlord of tools”. And rightly so. This Fluke wireless clamp meter does what it needs to do without any hiccup. An advanced tool that is both accurate and sturdy for the professionals who need a wireless meter for their job. 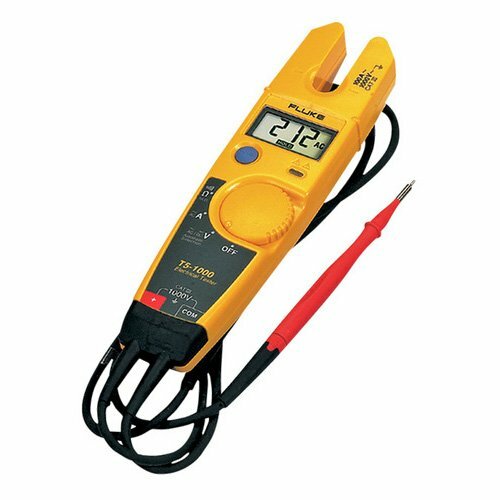 If you are looking for a meter that can withstand high current levels and is entirely safe at the same time, the Fluke 355 is just the right meter for you. Imagine an old Nokia mobile phone and visualize its bodily strength. Then compare it with the Fluke 355. Chances are the latter will be stronger. Fluke understands that if it wants to create a tool that can handle current in the levels of thousands, it better pay attention to the body. And the Fluke 355 clamp meter is brilliant in that regard as it can measure current magnitudes of up to 2000 A. 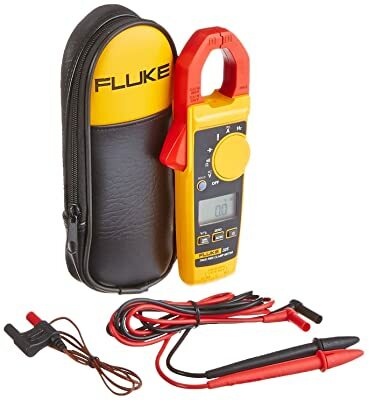 In addition to the ability to measure other quantities, this Fluke meter has a wide jaw which makes the measurement of large conductors easy. This is really helpful because conductors that carry large current values are bigger in size. While its price is on the heavy side, Fluke has packed all its electrical technological strength into this model. There’s no way anything is going wrong with this meter. 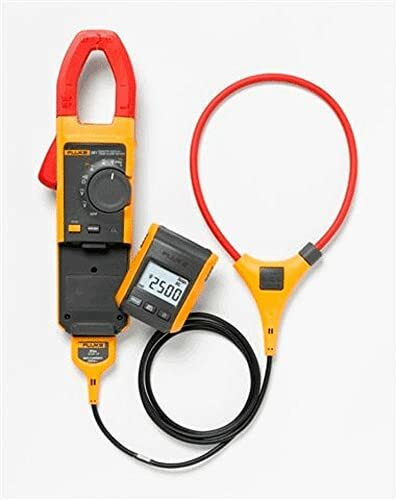 In your quest to find the best Fluke clamp meter, this model takes the pie as it can manage measurement of high current levels, is built solidly, and gives accurate results. The highlight of this model, specifically intended for use in expansive industrial areas, is the nifty remote display feature that can show readings from meters away. Comes in very handy if you are supervising a troubleshooting task and the engineer is near the equipment and you are in your cabin. 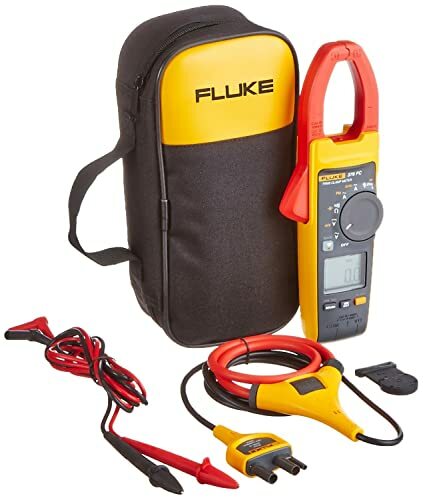 The Fluke 381 can measure up to 1000 A and 1000 volt AC and gives highly accurate results even in the high levels. It is built very well and can withstand sweat, dust, and pressure. However, caution must be exercised while handling the remote display as it is very sensitive than the meter. There’s nothing more that one would desire in a meter. It’s the perfect model for any advanced user. Testing and troubleshooting can take up a lot of time. Not if you own the Fluke 381 clamp meter with remote display. Now that we have covered the heavyweights, it’s time to please the hobbyists out there. For those looking for a handy clamp meter to take quick basic measurements and general electrical testing, these three models are to consider. To wrap all these features and still price it under $50 – Tacklife must be one of the good guys. Although it lacks the sturdiness of a Fluke or a Fieldpiece, this meter definitely has the chops to give you accurate readings. The amp meter works like a charm, but we loved its non-contact electric field meter which allows detection of live wires in a wiring structure. With enough strength to withstand a fall, it is a good product for those looking to test small circuits and equipment. The probes are very good as compared to other budget clamp meters, which makes it one of the best digital clamp meters in this price range. This is a well-made clamp meter that does its job nicely and relentlessly. Working on a small project in your house and need a small clamp meter for occasional check-ups? This is it. Most electricians who are passionate about electrical engineering have multiple meters in their toolbox. This Uni-T digital clamp meter is usually their choice for portability. Priced like a product on a flea market, this mini clamp meter is packed with all the features and abilities of a top-quality meter with only one difference: size. It is the smallest meter on this list and still gives equally accurate readings as its competitors. 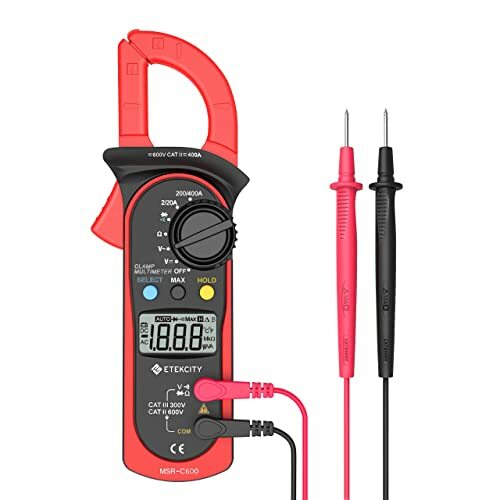 If you are a hobbyist who takes interests in electronic circuits, this meter is the one to go for as it measures DC current and voltage with total accuracy. Uni-T packs both quality and quantity (features) in this tiny tool that is the best option for hobbyists and home users. If the Uni-T model still out of your budget, then we have the perfect alternative for you. This Etekcity model is the cheapest on this list, and yet capable enough to take care of all your basic requirements. In addition to AC and DC current and voltage measurement, it can also test resistance, diode, and continuity. Lack of capacitance or temperature measurement is the only drawback. It might be surprising to learn that the Etekcity MSR-C600 also has data hold and a min-max button for you to analyze the quantities that you measure, a feature that is missing in most models in this price range. Even though it has a one-year warranty, Etekcity meters are known to function for years and years as power conservation is one of its biggest fortes. Sufficient functions and features, high accuracy, and small size make this the best clamp meter for the money. A great choice for occasional users. For the uninitiated, a clamp meter is a type of electrical testing tool that can measure the magnitude of a current through a conductor without touching it or disconnecting the circuit/system. It uses a jaw-like structure that can be fitted around a conductor (an insulated wire, for instance) to detect the magnetic field generated by the conductor in real time. It works on the principle of “transformer action” to detect a fraction of the current, and then converts the value into a higher resolution. This contactless measurement feature is what makes clamp meter an essential tool for electricians working in high energy environments. There are different types of clamp meters available in the market, and users can select them depending upon their requirements. There are meters that measure both AC and DC, models that also measure quantities like temperature and frequency, and also flexible clamps that can be used to measure current in hard-to-reach areas. Clamp meters are majorly used in assembly lines, automation and HVAC environments, and areas where disconnecting the system for current measurement is difficult. Compared to general-purpose digital multimeters (DMM), clamp meters have the additional feature of contactless current measurement. They are mostly similar in their functions with another difference being the resolution. DMMs give readings in higher resolutions whereas clamp meters are restricted to hundredth of a unit. Having said that, it makes sense for a professional electrician to own both a DMM and a high-quality clamp meter. These are the best clamp meters that you can buy right now. Each model has been chosen basis your specific requirements and is categorized so that you can make a quick decision. The key to finding the best meter is to check out the clamp meter reviews and then base your selection on the features that you want. Since these meters are often a one-time investment which lasts long for years and even decades, the price factor should come last. But, if the cost is something that is on your criteria, check out the models priced under $50. For everyone else, we have advanced meters and ones that are specifically made for HVAC use. We hope that this guide will make your purchase easier. Let us know your thoughts on this in the comments below and tell us what you love about your clamp meter. How To Use A Clamp Meter? How to Choose The Best Clamp Meter?